"Our decision to increase our dividend and stock repurchase authorization reflects our confidence in our multi-channel, multi-brand model and our strong cash flow generation. This also demonstrates our commitment to maximizing returns to shareholders." 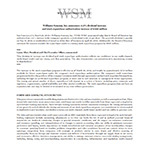 SAN FRANCISCO--(BUSINESS WIRE)--Williams-Sonoma, Inc. (NYSE: WSM) announced today that its Board of Directors has authorized an 11.6 % increase in the company’s quarterly cash dividend to $0.48 per share. The quarterly dividend is payable on May 31, 2019, to stockholders of record as of the close of business on April 26, 2019. Additionally, the Board of Directors increased the amount available for repurchases under its existing stock repurchase program by $500 million. The increase to the stock repurchase program is effective as of March 20, 2019, and results in approximately $710 million available for future repurchases under the company’s stock repurchase authorization. The company’s stock repurchase program authorizes the purchase of the company’s common stock through open market and privately negotiated transactions, including through an accelerated repurchase program, at times and in such amounts as management deems appropriate. The timing and actual number of shares repurchased will depend on a variety of factors, including price, corporate and regulatory requirements, capital availability and other market conditions. The stock repurchase program does not have an expiration date and may be limited or terminated at any time without prior notice. This press release contains forward-looking statements that involve risks and uncertainties, as well as assumptions that, if they do not fully materialize or are proven incorrect, could cause our results to differ materially from those expressed or implied by such forward-looking statements. Such forward-looking statements include statements relating to: the timing and amounts of our quarterly cash dividends; the timing and amounts of our stock repurchase program; our commitment to return capital to stockholders and maximize stockholder returns; our multi-channel, multi-brand model; and our ability to generate cash. The risks and uncertainties that could cause our results to differ materially from those expressed or implied by such forward-looking statements include: accounting adjustments as we close our books for Q4 18 and as audited year-end financial statements are finalized; continuing changes in general economic conditions, and the impact on consumer confidence and consumer spending; new interpretations of or changes to current accounting rules; our ability to anticipate consumer preferences and buying trends; dependence on timely introduction and customer acceptance of our merchandise; changes in consumer spending based on weather, political, competitive and other conditions beyond our control; delays in store openings; competition from companies with concepts or products similar to ours; timely and effective sourcing of merchandise from our foreign and domestic vendors and delivery of merchandise through our supply chain to our stores and customers; effective inventory management; our ability to manage customer returns; successful catalog management, including timing, sizing and merchandising; uncertainties in e-marketing, infrastructure and regulation; multi-channel and multi-brand complexities; our ability to introduce new brands and brand extensions; challenges associated with our increasing global presence; dependence on external funding sources for operating capital; disruptions in the financial markets; our ability to control employment, occupancy and other operating costs; our ability to improve our systems and processes; changes to our information technology infrastructure; general political, economic and market conditions and events, including war, conflict or acts of terrorism; the impact of recently enacted and potential future tariffs and our ability to mitigate impacts; and other risks and uncertainties described more fully in our public announcements, reports to stockholders and other documents filed with or furnished to the SEC, including our Annual Report on Form 10-K for the fiscal year ended January 28, 2018 and all subsequent quarterly reports on Form 10-Q and current reports on Form 8-K. All forward-looking statements in this press release are based on information available to us as of the date hereof, and we assume no obligation to update these forward-looking statements.